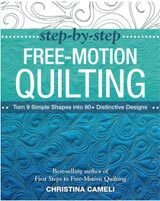 These machine quilting tips and techniques really boil down to the things that experienced quilters naturally do and don't have to think about anymore while they're machine quilting. 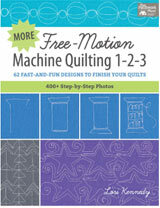 When you're new to free motion machine quilting (FMQ), your mind is crammed full of all sorts of do's and don'ts. But I promise that if you practice most, if not all, of these tips will come naturally to you. It's just a matter of making them your own! YOU need care and attention just like your machine. Look up from your work every so often. Focus your eyes on something far away to help to relieve eye strain. Get up. Move around. Shake out your neck and shoulders. Taking care of yourself means being able to quilt longer and more comfortably. Focus your eyes where you'll be quilting next. Do not watch where the needle enters the fabric. Driving a car is a good analogy. You don't look where the wheels hit the pavement. Eyes are up and focused on the signs showing where to go next. This skill takes time to learn. So practice. Persevere. The confident skill you earn is well worth the effort. Ditch quilting and FMQ use two different eye positions, so it's best to do all the ditch quilting at one time. Do the FMQing at another. Do not switch back and forth during the same session. Do your stippling or background fill stitching last as it tends to draw up the quilt. Feeling tension or a tug on the quilt while quilting? It has ‘hung up’ somewhere. Stop immediately. Reposition the quilt. This will prevent you from ripping out stitches. Need to reposition your hands? Stop immediately with the needle down. Reposition your hands. Continue stitching. Do not try to ‘walk’ your hands while you're stitching. You are not in control of the quilt sandwich and it will show in your stitches. You must be able to move only the part of the quilt that is under the needle, between your hands. The rest of the quilt must simply be out of the way. Smush, push or fold the quilt under the arm of the sewing machine. Distribute the quilting as evenly as possible over the quilt. Densely quilted areas have a tendency to draw up and get smaller. Sparsely quilted spaces do not draw up as much. Uneven quilting produces ‘waves’ that will be noticeable when the quilt is hanging. Matching thread reveals the texture of your quilting stitches. Contrasting thread adds another layer of design to the quilt top. 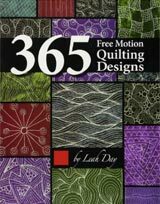 Monofilament is wonderful for quilts made with many fabrics. Test both clear and smoke colors. Sometimes clear looks like the best choice until you test. Then you find that smoke color is ‘clearly’ better. 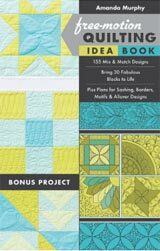 Use a patterned or busy quilt back to hide your quilting stitches. Your starts and stops won't be as noticeable. A patterned back also helps mask tension problems. Use the ditch or the well of seams to travel from one place to another for short distances. This saves time by eliminating many starts and stops. And yes, you CAN FMQ in the ditch. Use echo quilting to travel to another area to be quilted. This, too, saves the bother of many starts and stops. Always warm up on a practice sandwich. Some days are better than others for quilting. Does your backing fabric "stick" or "grab" the sewing machine bed while you stitch? Starch your backing before layering it in your sandwich. Starch helps the backing slide. We hope these Machine Quilting Tips are helpful. Remember, if you practice you'll begin to use these tips without even thinking. Deal? Excellent! It's time to move onto stippling and other background fill stitches.